Orlando is an up and coming American stand up based in Boston, MA. 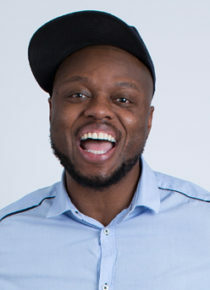 Starting his international adventures at the Montreux Comedy Festival in 2014, Orlando has since performed at the first Johannesburg International Comedy Festival, did a short run on the Free Fringe in Edinburgh in 2015 before bringing his fantastic debut show Suspensions, Detentions and Summer Vacations to the main Fringe last year. Having already got a few episodes of Gotham on AXS under his belt, Orlando made his late night debut on Conan in Autumn 2016, which you can view here. In 2017 Orlando made his Australian debut at the Melbourne International Comedy Festival as part of the ‘Headliners’ show, and recorded an episode of Comedy Up Late for ABC2. He also appeared on The Art’s Hour International Comedy Celebration on the BBC World Service and can be seen on BET’s 50 Central. Orlando will be returning to the Edinburgh Fringe this year with his brand new one-hour show Finding Mariah.